CITE AS: Chiz Harward, "John Stow and the City Ditch," in 100 Minories, April 15, 2015, https://100minories.lparchaeology.com/john-stow-and-the-city-ditch/ [Date Accessed: April 23, 2019]. 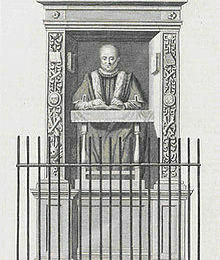 Engraving of John Stow’s memorial in St Andrew Undershaft church. This post was originally posted as ‘100 Minories, John Stow and the City Ditch’, on the Urban Archaeology website, November 9, 2014 – click here to read the original article. ***Please note that this article was written before excavation work had started on the City Ditch. Up-to-date insights will follow once post-excavation analyses have been completed …. At 100 Minories we will be excavating the City ditch which surrounded the City of London. A wall and ditch was built around the landward sides of the Roman settlement of Londinium around 200 AD, and along the Thames from c 280 AD. Following the re-occupation of London by King Alfred in 886 AD the walls and ditch resumed their defensive function and there is evidence for the continued repair, rebuilding and strengthening of the City wall and bastions throughout the Medieval period. In addition archaeological excavations have shown that the City ditch was repeatedly cleaned out and recut. Whilst the walls and ditch were maintained throughout the medieval period, by the end of the Tudor period there were increasing encroachments onto the City ditch, and the whole area immediately outside the City walls was in the process of being built up and becoming a new suburb. A valuable source for London archaeologists is John Stow’s ‘Survey of London’, originally published in 1598 and containing historical information on the history of London, as well as personal observations from Stow’s own lifetime. John Stow was born about 1525 and was a merchant tailor who lived in the east of the City, he was a keen antiquarian and gathered the information for his Survey of London over several decades. The Survey describes the situation, history and main features and customs of London, before describing each Ward in turn. The book is available online from British History Online here. Stow died on April 6th 1605 and there is a memorial to him in St Andrew Undershaft and every three years the quill pen held by his effigy is renewed by the Merchant Tailors in a memorial service. Stow first reference is to the digging of a ditch 200 feet wide around the City between 1211 and 1213, followed by a succession of dates when the ditch was ‘cleansed’ or the walls repaired. Clearly there were issues with the ditch silting up and with rubbish being dumped in it. ‘the same was cleansed, namely the Moor Ditch, and not long before from the Tower of London to Aldgate’. Whether we will be able to archaeologically identify individual ‘cleansings’ of the ditch remains to be seen, however Stow does provide a framework for the management of the ditch, and the evolution of the area to the east, that will help set the archaeological evidence in its wider context. His Survey is a plainly written, yet very evocative description of London, and the period of his life corresponds to the development of the 100 Minories area, and the creation of the new suburb. Stow’s mixing of personal observation and recollection juxtaposes with his historical sources and is a wonderful source on Elizabethan London and its life. Rembrandt van Rijn (1631) [Oil on canvas]. ‘Scholar at his desk’. [Herimtage Museum]. PD-ART (n.d.) An enraving of the John Stow monument in the parish church of St Andrew Undershaft in the City of London.